Ever since Count Ferdinand von Zeppelin served his guests turtle bouillon, lamb chops and champagne on the world's first international passenger flight in 1912, on-board catering has been key to winning the hearts and stomachs of top-paying passengers. These days, about four million meals are consumed in the air every day. So with competition increasing between the highest-rated airlines in Asia and the Middle East, it's no surprise that their battalions of food trolleys are in the vanguard of the fight for premium passengers. Cathay Pacific and Singapore Airlines introduced new food and beverage offerings as they try to lure back premium passengers from carriers such as Emirates and Etihad that offer shower spas and luxurious suites. The Middle Eastern operators have used their geographic position at the crossroads of global flight paths to build giant transfer hubs that connect passengers between Asia and Europe and the US. As the champagne corks pop, we take a look inside the galleys of five airlines to see how each is looking to appeal to the modern road warrior. Rated as the world's best business class by Skytrax last year, Singapore Airlines is targeting the health conscious traveller with new dishes in first and business class that are high on protein and essential minerals. The so-called "Deliciously Wholesome" meals use fresh vegetables, lean meat, fish, seeds, herbs and spices that the airline claims help passengers feel less tired and jet-lagged after a long trip. Under the carrier's Book the Cook service, you can order a meal online in advance from one of Singapore's panel of international chefs. Think spring salad bouquet of haricot vert beans, artichokes, asparagus and tomatoes with boiled eggs and roasted walnuts, designed by triple Michelin-starred Georges Blanc. But don't worry, there's still a Charolais steak with foie gras, white wine and truffle Perigueux sauce to be found if you're not so concerned about the jet lag. Hong Kong-based Cathay teamed up with Mandarin Oriental Hotel Group last year to design a menu for its first-class cabin and has been busy adding Chinese cuisines to lure mainland flyers. 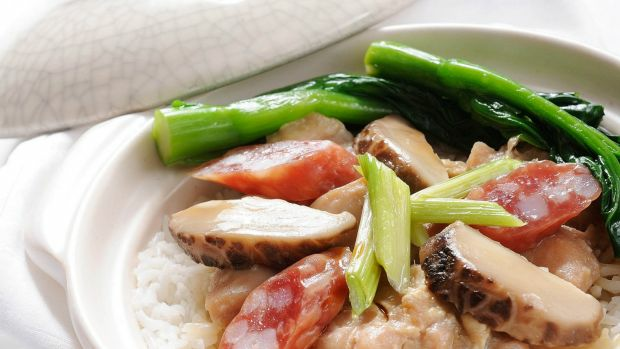 Try a seasonal winter melon soup, clay pot rice and hairy crab roe, for instance. The 14 types of noodle soups are very popular in first and business classes, or for a trip into Hong Kong's colonial past, there's a tiered English cream tea, complete with scones and strawberry jam. Cathay has also upped its game down in the cellar, hiring Debra Meiburg, one of five Masters of Wine based in Asia, to help sample beverages that go nicely a mile above the ground. Speaking of wine, why start with the food and pair the wine when you can do it the other way round? Emirates introduced Dom Perignon vintages last year to first- and business-class with pairing menu of canapes that included cured duck with saffron poached peach and wild smoked salmon, lemon and cumin cream cheese on Norlander bread. The airline also has delved into some of the best-known chateaux in Bordeaux for its wine selection. 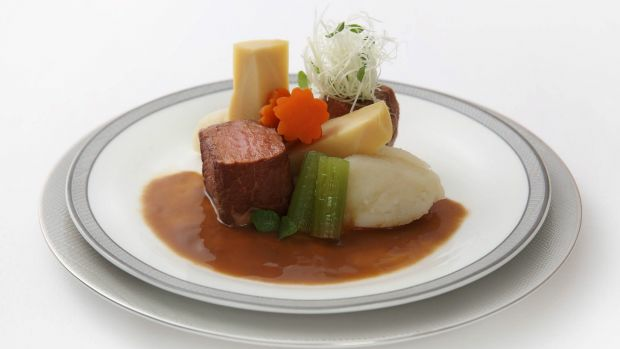 Emirates' food menu has also taken the healthy tack, with offerings shunning the evil saturated fats and added sugars. 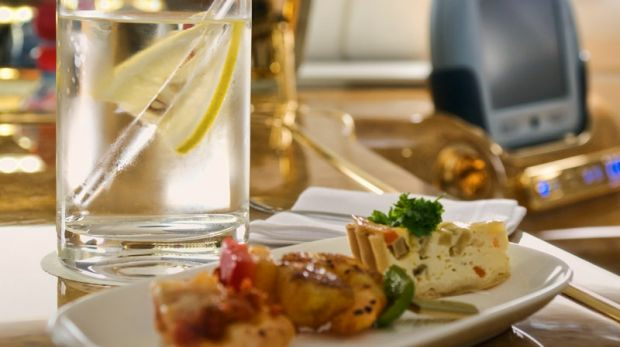 For those who want to socialise at 40,000 feet, premium class passengers on the A380 can head to the bar, graze on canapes and get the bartender to fix you a drink. Etihad caused a stir with the introduction of its three-room luxury suite on its superjumbo called The Residence, which comes with a Savoy-trained butler, en-suite shower and private chef, earning the Skytrax award for the best first-class cabin. For those slumming it back in business class, the situation is still far from dire. 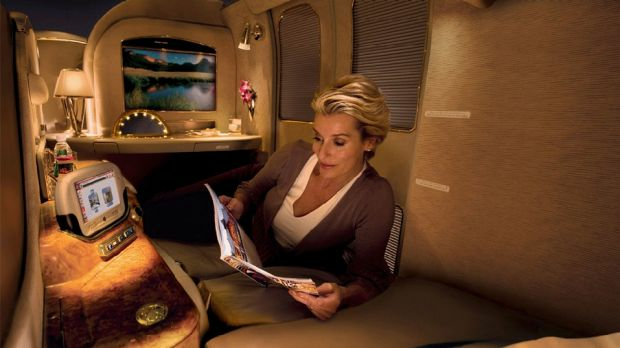 Half a dozen premium-class passengers can socialise or hold a meeting at the "Lobby" on the upper deck of the airline's A380 aircraft. 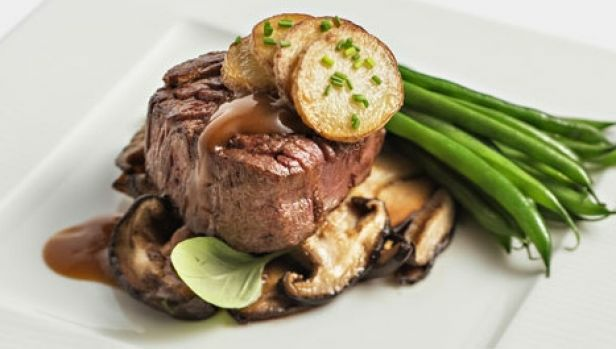 Etihad has an all-day dining menu in addition to its a la carte options, rather like room service, so you can eat that steak sandwich whenever you like. Alternatively the airline's food and beverage manager will assist you in selecting dishes like Gulf lamb machboos, and there's always the classic Arabic mezze platter. While Etihad has gone large for its super-elite customers, it's gone small for the wine selection, choosing bottles from smaller, boutique vineyards, rather than big producers. Have a glass of champagne Jacquart 'Mosaique'. For its business-class cabin, Qatar signed up celebrity Michelin-starred chefs Nobu Matsuhisa and Vineet Bhatia, with a sample menu including a roasted mustard and dill salmon with dill pine nut rice as well as the necessary mezze selection. The caviar starter is a particular favourite, but Etihad's silver bullet in its food offerings is storied French bakery Laduree, which has been churning out handcrafted pastries and macarons for more than a century. Chocolate torte, anyone? Like Emirates, Qatar also has its club in the sky on the A380. You can sip an Old Fashioned prepared by the on-board mixologist. Count von Zeppelin would have approved.